On Friday, August 19, 2011, there was quite a show at Stir Cove in Council Bluffs, offered by the Carnival of Madness Tour. 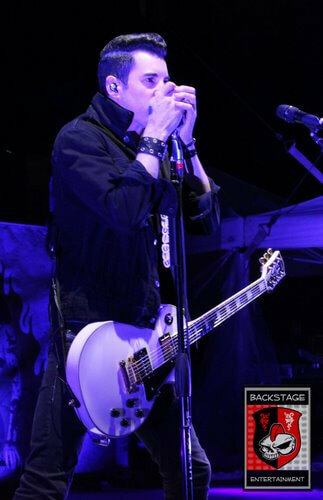 Performing bands included Theory of a Deadman, Alter Bridge, Black Stone Cherry, and Adelitas Way. Each band got the fans moving and singing along. First to perform was Adelitas Way, just coming off their latest album release, “Home School Valedictorian.” The guys said the name of the album comes from people who think very highly of themselves and think they’re the best at everything. Next came Black Stone Cherry who in May released their album “Between the Devil and the Deep Blue Sea.” They’ve released a couple singles from the album. Lead singer Chris Robertson says the tunes are just fun party songs. The acts of the night had to be Alter Bridge and Theory of a Deadman. Alter Bridge consists of three of the four members from the band Creed along with lead singer, Myles Kennedy. Their latest album, “AB III” was released in October 2010 and it’s still going strong on the charts. Mark Tremonti, guitarist, said they hope to release at least a couple more singles from this album before working on the next. Theory of a Deadman is just coming off their recent album release, “The Truth Is…” which was released on July 12th. Before the show I got to interview all four bands and below you can find the links to the interviews. Be sure to check out each band online through their websites, Facebook, or MySpace, and also look for their new albums in stores now. Educator Tackles The OtherWhy not Creighton?